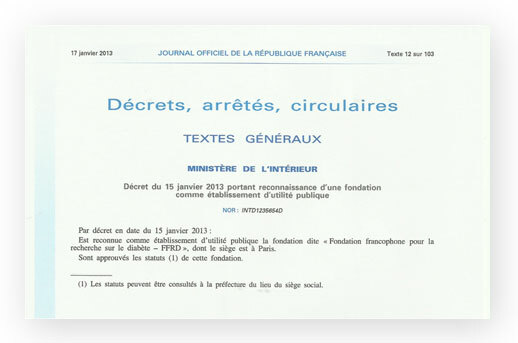 State-recognised as serving the public interest through the Decree of 15 January 2013, the Francophone Foundation for Diabetes Research (FFRD) has the unique goal of promoting and supporting research on diabetes and metabolic diseases and hopes to improve knowledge of diabetes and limit the significance of its complications through all of these projects. The purpose of the foundation is to promote research on diabetes and associated diseases in order to increase knowledge and improve the quality of care provided to the patients. This foundation was created by the Francophone Society of Diabetes (SFD). To promote and support research on diabetes and associated diseases, particularly through public and private collaboration. These rules of procedure are intended to provide information on the method of operation of the Francophone Foundation for Diabetes Research, which was created by the Francophone Society of Diabetes. The articles of these rules of procedure may in no way alter the terms of the Statutes.